Ollie Krueger’s days as a punk kid practicing street magic are mostly behind her. Now she’s a butcher at Carnage, a high-end restaurant offering deconstructed takes on meat, and on the busiest nights of the week she and her partner, Guychardson, race to see who can produce more finished cuts. Ollie’s the better butcher, but somehow Guychardson almost always wins. And Ollie thinks maybe it’s because the mysterious knife he uses is magic. Now, magic is back in Ollie’s life and she’s being chased through New York City, with the fabric of space-time tattering around her and weird inter-dimensional worms squirming their way into her kitchen. And before all this is over she’s going to need to face up to the Possible Consequences of some bad decisions, to look at the uncomfortable truths that she stuffed away long ago, deep down inside . 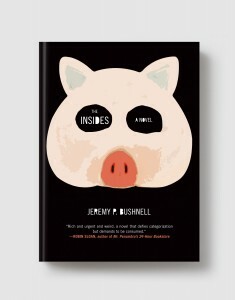 . .
Full of wit, imagination, and suspense, The Insides is Jeremy Bushnell at his finest. 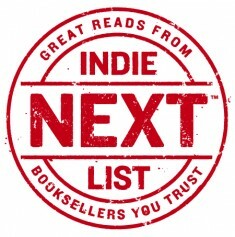 An Indie Next List pick for June 2016!